of Tanzania. We have been temporarily posted in Kenya for two years and have quite a long trip to get back 'home' again. moves there to work together with a church developing local farmers. James, Yohana, Abel, and Frenki. 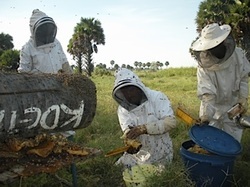 raw honey cleanly and in a way that can be replicated in Africa. The harvest was quite remarkable with 1,019 pounds of honey being harvested. 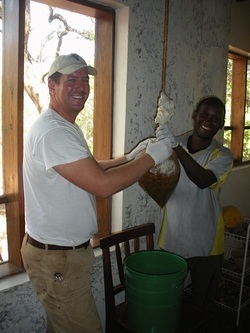 After pressing, settling and filling buckets we ended up with 700 pounds of processed honey. Ten and a half twenty-liter buckets! 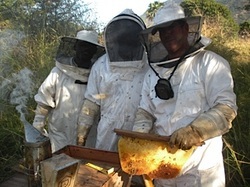 The funds made from honey sales will go directly back into the project. Our goal is 50 more hives in the forest by next year. The honey was taken to the Saba-Saba farm show in Dar es Salaam and voted the best honey at the show by everyone who visited our booth manned by Eliamu Mulungu. Comb cappings and slowly separating honey can be put in cheese cloth or clean pillow case to drain over the next few days. God has put amazing sustainable natural resources in front of all of us here in Africa. Our goal is to help local people learn to manage and use the natural resources with which they have been blessed. Look around you. What things do you see that are under-developed resources that could benefit humanity? How can you help local people harness those things in a positive way to impact their livelihood? Africans are diversifiers; they make an annual living from many different local sources. How about clay? How about sunflowers? How about bees? We have found that these to be the three most life-changing resources we have helped local people get 'in touch' with in the past couple of years. God help you as you look at your environment and try to determine what has been placed there by our Creator to help change the lives of those living around you. The finished product is always exciting! 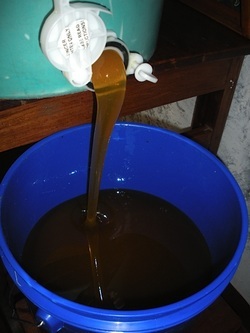 Putting honey in a settling tank for a few days will let it “clear up” as any wax residue will float to the top. The gate valve pictured here allows for the flow of beautiful clear honey. 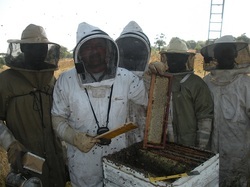 Tanzania came to Kapenta to have a 'hands-on' experience with African bees. Jericho with a beautiful full comb of capped honey. 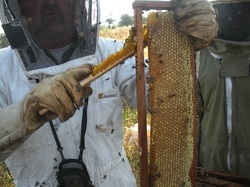 Brushing bees from comb before harvesting. Super of honey from Langstroth variety of hive. Lowering hives hung in trees for protection against theft, Siafu ants, and honey badgers. You couldn’t ask for a fuller hive of honey than this one! lots of wax. 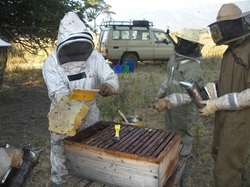 We always have at least 10 log hives in the bush to produce the wax we need to 'bait' our hives for next year. 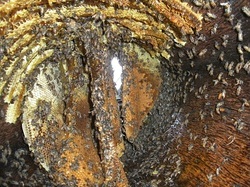 Inside of a log hive after harvesting. You can see how the bees attached their comb in a spiral pattern to the roof of the hive. This hive had about 16kgs of honey in it. 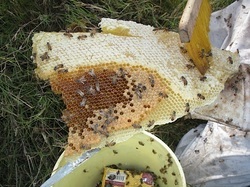 Mixed comb of honey and brood from log hive. 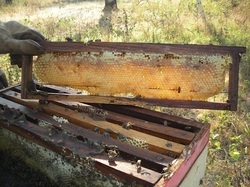 Careful handling of this comb produces good clean honey.